•Removing vertices causing self intersection or examining a multi-part polyline can be easier if the sketch properties window is used. 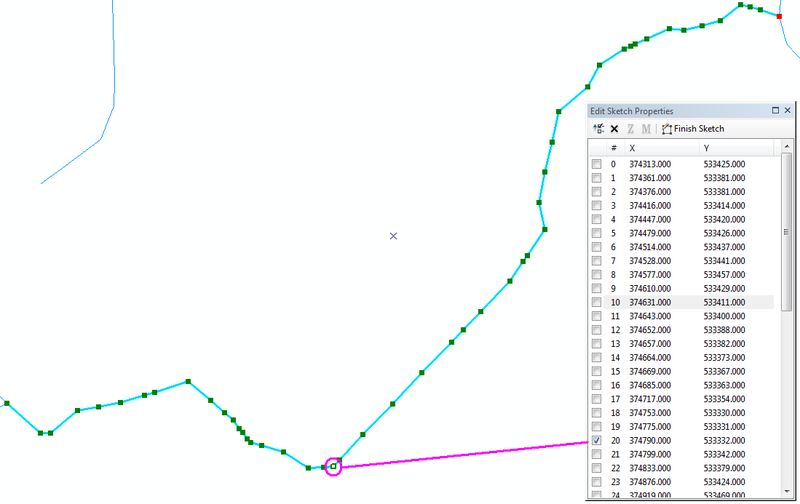 •Start an edit session and select the polyline in question using the select tool. •Click on the Edit vertices button ( ) on the editor tool bar to display the individual vertices. It's vertices will display as green squares. The red vertex is the To-Node. •Click on the Sketch Properties button ( )on the editor tool bar. •In the below image, the sketch property window indicates the polyline consists of a single part. Vertex 20 has been selected and the magenta circle highlights the number 10 vertex which is now displayed with a white box. Using the up and down key on your keyboard you can select the adjacent vertex. By watching where the white box goes you can tell exactly which vertex is wrong. •Right click on a vertex in the sketch property window will display a pop up menu offering a variety of actions, including zoom to, flash and delete vertex . •Holding the shift key down when selecting a vertex via the sketch property window will allow you to select multiple vertices, all of which are displayed as white boxes. •As you have seen the sketch property window is a very useful way of looking at your data on a vertex by vertex basis.